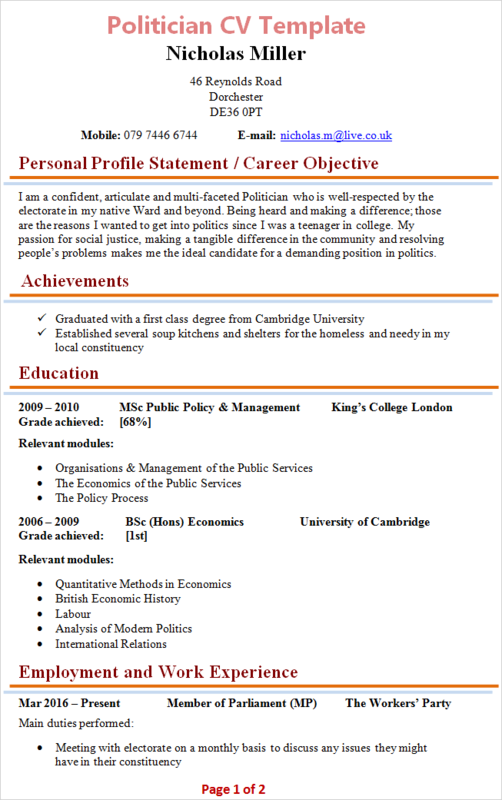 Tip: Use the Politician CV Template below as an example to help you write your own personal and fully-tailored CV. I am a confident, articulate and multi-faceted Politician who is well-respected by the electorate in my native Ward and beyond. Being heard and making a difference; those are the reasons I wanted to get into politics since I was a teenager in college. My passion for social justice, making a tangible difference in the community and resolving people’s problems makes me the ideal candidate for a demanding position in politics. Making a difference: The key reason why many individuals become Politicians is to make a real difference in the lives of people in their community or country. As a public representative, it is your duty to look after the needs of your constituents and resolve their problems. Your CV should, therefore, mainly focus on the “human side” of politics, including your passion for helping people, getting satisfaction from making a positive difference in the community and proudly representing your local area in national politics.